One puts some grains of di-vanadium pentoxide along with a spatula-tipful of oxalic acid in a test tube. Through shaking one mixes the mixture and then heats it until the oxalic acid has completely vaporized, whereby coalification also occurs. After cooling one adds approx. 2 ml of water to the deposit and sways the tube back and forth. The water takes on a light blue coloration. The residues can be deposited into the drainage. 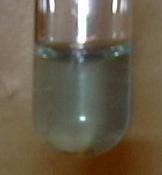 Vanadium(V) is under heat reduced to vanadium(IV) through the oxalic acid. This can be recognized by the light blue coloration.